DevSpace, a Microsoft Garage project. Connect to your Visual Studio Online (VSO) project anytime, anywhere. 5. View change history (GIT, TFS) and details. 6. 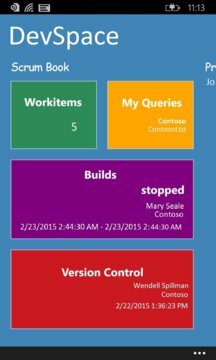 Secondary tiles support for workitems, builds, changesets and queries. 7. Sign in with your Live Id or Organizational Account. 9. 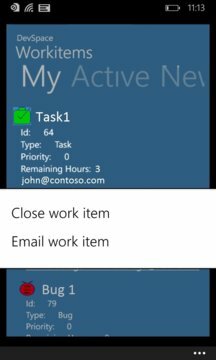 Cortana integration (Voice commands) to queue build, close tasks, open scrumbook, open builds, etc.